First Post – How Tijuana Adventure came to be. I was living in Los Angeles in 2008 with my oldest brother, while my middle brother resided in San Diego. I visited my middle brother at least once a month in San Diego, then he slowly started partying in Tijuana, a place I was terrified of. Next thing you know, my brother falls in love with a Tijuana local and shortly there after decides to move there. I thought he was crazy for doing such thing and I said that he probably was going to get shot. Little did I know that a couple of years later I would fall in love with the city. It happened little by little, I was afraid of Tijuana and would not cross my car. After all I had a 2008 Volkswagen GTI that was a lease from my company, I couldn’t risk it. I would either park by my brother’s old place in San Diego or by the border parking lots that charge $7 for 24 hours, my brother would pick me up and take me back to his house in Tijuana. Since the moment we crossed the border, I had no idea what was going on, I visited Tijuana to just hang out with my brother. Soon I met my sister-in-law’s brother (get it? a.k.a. brother in law? my brother’s brother-in-law). Anyway, I met him, the lead singer of a trash-core (heavy punk) band in Tijuana. I started going out and exploring the city, under his guidance, of course I would buy all the beers. I was living in LA and making a comfortable living, so paying $2-4 beers was amazing. The punk shows were great too, way better vibe than that of concerts in LA where everyone is either filming or texting. I told my friends in Los Angeles how amazing Tijuana was and I convinced a few to come down with me. Tijuana Adventure Tours started without me even living in Tijuana or charging any money. A year later, I switched agencies for my job in Los Angeles, so I gave the company car back and got myself a 95′ Miata with a broken roof. Not scared of crossing my car anymore, I started driving into Tijuana and I would get lost immediately. Though I dominate the Spanish language, I would get lost in places where I would be afraid of speaking to the locals. For the most part, I would park my car in my brother’s garage then walk around the city exploring new bars and new shows. By 2011, I was sick of my job in Los Angeles that I decided it was time for a long vacation. I sold my 95′ Miata bought a 2005 Mazda 6 and traveled all around the United States with the idea I would come back to LA to work. After three months of road tripping, I came back to LA, realized I hated not only my job, but the city as well. So I quit my job and moved to San Diego. I moved to San Diego because I was still afraid of Tijuana, I still believed that my possessions wouldn’t be safe in an apartment in Mexico. Moving to San Diego was the wrong choice. Not only did it remind me of LA a lot, I was going to Tijuana every weekend and the rent was really expensive. Worst yet, I wasn’t even in San Diego, I moved to Rancho Peñasquitos in North County, where rent was $550 for a small room in a house and you have to drive everywhere. Though I needed a job, I was reluctant at taking any. Multiple job offers and interviews came and I didn’t show up to them. Instead I occupied my time hosting multiple people from couchsurfing in my San Diego home, and taking them to Tijuana to party with me. They all loved Tijuana more than San Diego. I lasted in San Diego half a year, when I ran out of money. I found a one bedroom apartment for $350 in a nice building in a neighborhood I’ve never even been in Tijuana. I took the plunge and moved back, not able to getting a job right away, I sold my car thinking about buying a cheaper one. I soon came to realize that there is no need of a car in Tijuana, public transportation is effective. It’s the weirdest public transit I ever seen in my life and I’ve been to a lot of places, but somehow it’s cheap and it can take you anywhere in the city. I landed an office job in Tijuana that paid in pesos, which was not really convenient. But I stuck with it for a while. In the meantime, all my friends from all over the United States were worried about me in Tijuana, but they wanted to come visit. I hosted them all happily and obviously for free. The idea of Tijuana Adventure came after a lot of my friends insisted that I could be charging for showing Tijuana around, specially since I know the city very well and a lot of the locals. Tired of my job and realizing I could make money from doing something I love, I quit and started Tijuana Adventure. 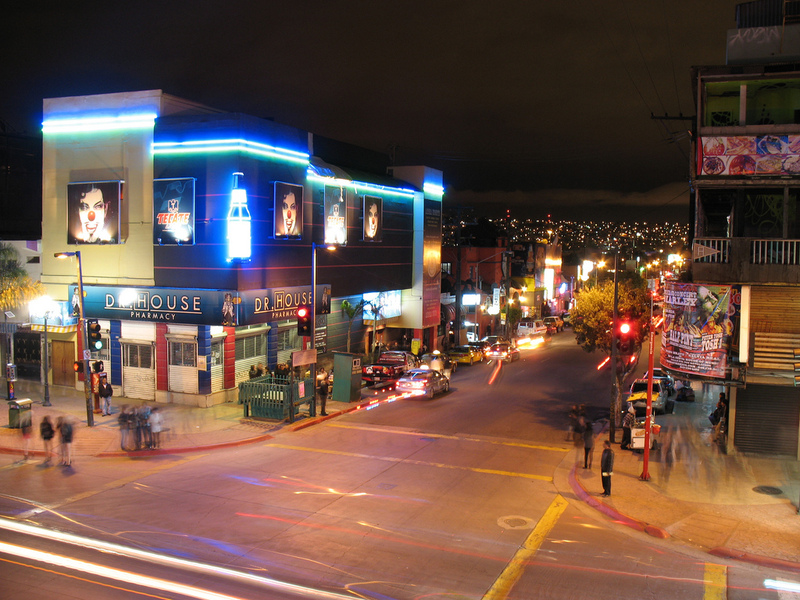 Tijuana has changed for the better in the short period of time I’ve been visiting and living. Tourism and the whole city is booming with new life. Encouraged by my friends, my surroundings and my love for the border city, I took the plunge and started Tijuana Adventure. Tijuana has everything anyone could imagine and the arts, music, food and drink industry is rising. Not only that, the popular Red Light District (Zona Norte) is taking new life, for the ones that are into that sort of thing. There’s a new boardwalk on the beach the re-vamped the whole Playas de Tijuana. Trendy coffee shops open everywhere. New artist and musician hang outs spread through the city. Characters from all over the world end up staying in Tijuana, not knowing what brought them here, but for some reason they know they have to stay. A new city is brewing, post-modern 21st century clash between the 3rd world and the 1st world gives Tijuana it’s own culture. Culture that is yet to be defined, but that soon will spread everywhere. Popular Sexta Street in Downtown TJ.